This was supposed to be the year the Edmonton Oilers climb out of the Western Conference basement and started showing signs of life. This was supposed to be the year that all the young playmakers on the roster came together around Connor McDavid and showed the organization, its fans and the league as a whole that in another year or two, Edmonton was going to be a team that no one wanted to play. Then McDavid crashed into the end boards against the Philadelphia Flyers, breaking his collarbone and bringing a lot of the hopes and dreams crashing down as well. Sitting at 9-15-2 through 26 games, the Oilers reside in familiar territory, hanging out in the basement of the Western Conference, jockeying with the Carolina Hurricanes, Columbus Blue Jackets and Calgary Flames for the best odds to draft first-overall in the 2016, “We’re pleased to select Auston Matthews” Entry Draft. With the team struggling yet again and McDavid not due back for a few more weeks (at the earliest), the talk about who is going to be packing their bags and relocating out of Edmonton is heating up. It’s an unfortunate situation for all parties involved – the players whose names are coming up in trade talks (primarily Jordan Eberle and Ryan Nugent-Hopkins), the remaining core of players that are experiencing this struggle and are left wondering if their friends and teammates are going to be at practice tomorrow and the first-year tandem of general manager Peter Chiarelli and coach Todd McLellan – because the majority of this is not their fault. Sure, some of the players are under-performing and haven’t lived up to expectations and Chiarelli’s first offseason acquisition as the man in charge of the Oilers – goaltender Cam Talbot – has been a flop, but a lot of the onus for the current sad state of this once proud franchise falls on the guy that was finally ushered out of power after last season, Kevin Lowe. Over a 10-year stretch from 2005 to 2014 (inclusive), eight of Edmonton’s 10 first-round picks were spent on forwards, including the trio of first-overall selections that yielded Taylor Hall, Nugent-Hopkins and Nail Yakupov. While Hall has proven himself to be one of the best left wingers in the game and 2014 third-overall pick Leon Draisaitl has been a spark since being recalled, the rest of the remaining members of that draft collective have come up short. Alex Plante played 10 NHL games over three seasons before decamping for Europe. Andrew Cogliano, Sam Gagner and Magnus Paajarvi were all shipped out at some point in time for pieces that are either no longer with the club or are spare parts for the struggling Oilers. Nugent-Hopkins is solid, but hasn’t blossomed into the first-line center the club envisioned him being and Eberle has regressed every year since looking like a future superstar after tallying 76 points in 78 games in his sophomore season. We’re at the point where Edmonton is starting to run down their roster and figure out which players are going to be part of their core going forward and who will be playing elsewhere in the future. 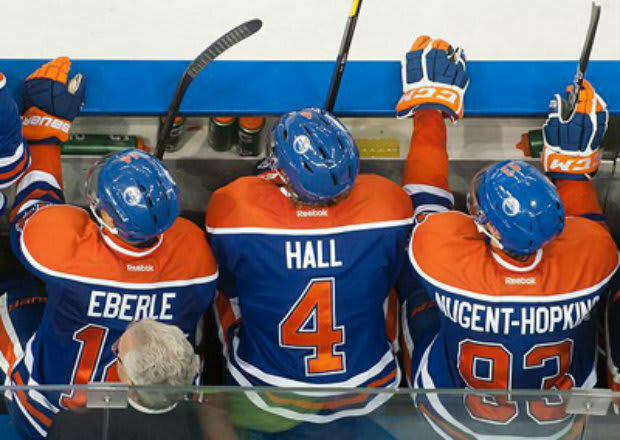 Best guesses are that McDavid, Hall and Draisaitl are the holdover forwards while Darnell Nurse and Oscar Klefbom are the defensemen and everyone else – including Talbot – are expendable. That’s not Chiarelli’s doing and it’s hard to knock the players too much since they’ve been playing for an inept franchise that cycled through six different coaches (including MacTavish twice) in the span of seven seasons, resulting in zero consistency or structure. It’s mostly the remains of Kevin Lowe’s time in charge of this franchise and unfortunately, even though he’s gone, it’s going to take a couple extra years before the club can recover from the damage he did. Islanders-Senators-Rangers Triangle: these three clubs, who sit fourth, seventh and second, respectively, in the Eastern Conference standings, insect and are involved in the best games of the weekend. Friday, the Islanders play St. Louis (second in the West) before taking on Ottawa on Saturday, before the Senators head to MSG to take on the Rangers. This is a chance to get a good read on these three legitimate playoff teams just passed the 25 percent mark of the season.